I played tackle football every year between the ages of 8 and 21. I was lucky to avoid serious injury, but this article kind of scares me. Many times throughout my career, I took hard hits to the head but kept playing. Now I know that the ringing in my ears and yellow vision were signs of concussion. There is a very macho element to football that discourages coming out of a game for anything less then a broken bone (and sometimes not even then). Players are told to “shake it off” and reminded “football is not a contact sport, it’s a collision sport.” When I was in college, anyone who was diagnosed with a concussion was forced to wear a rubber pad on their helmet at practice the next week. 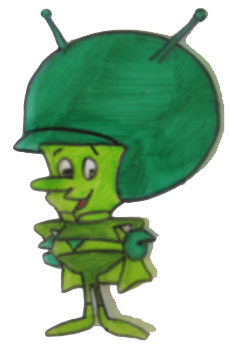 The pad made you look like Gazoo from the Fintstones. Much hilarity ensued. I can’t imagine professional players are any more mature than we were. As athletes continue to get bigger and faster, the hits will get even more violent. The league needs to address this issue yesterday. Otherwise, it will have a more serious image problem than retired players hobbling around on arthritic knees.